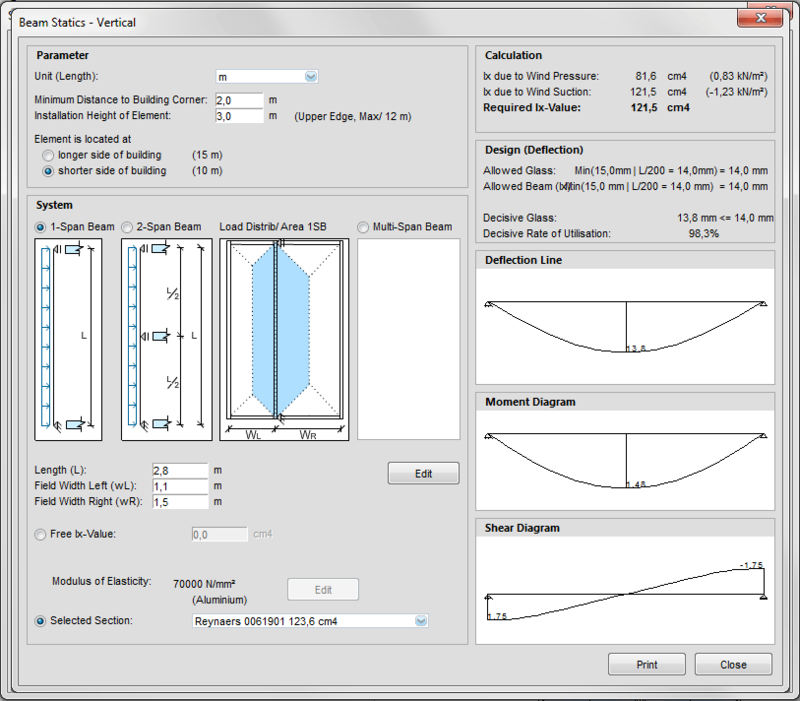 After having defined all actions click the button “Beam Statics – Vertical” on the main menu in order to perform a preliminary structural design for mullions. First of all select the applied length unit under “Parameters” and after this determine the beam’s position on the building. The latter is required to calculate the corresponding wind load. 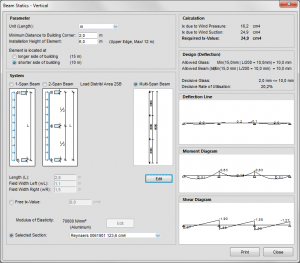 The it’s up to you to decide whether you want to design single, double or multi-span beams. 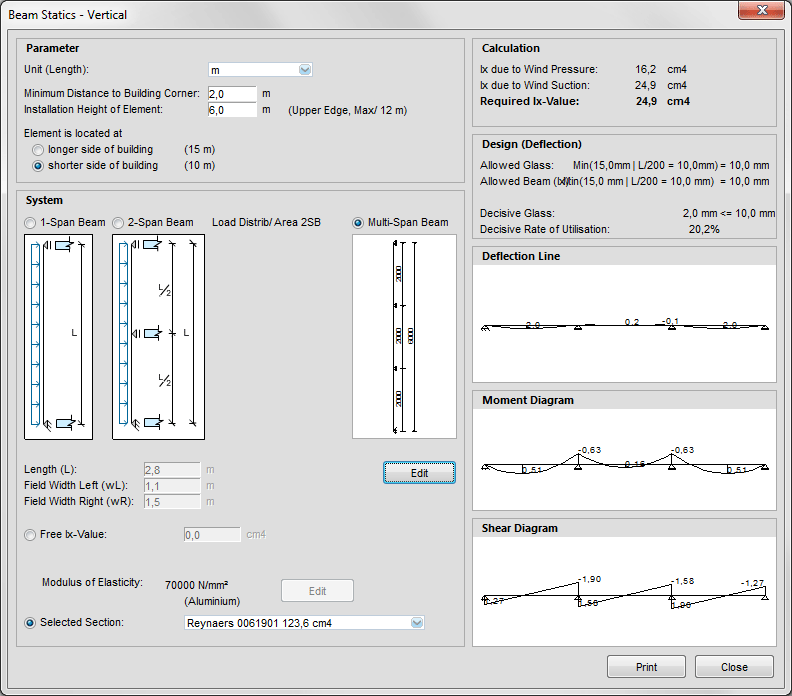 In order to calculate single-span-beams select under “System” the option “Single-Span-Beam” and enter the values Length (L), Field Width Left (wL) and Field Width Right(wR). 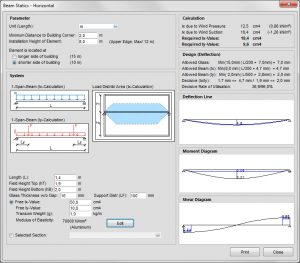 After this make a decision if you want to apply database profiles or if you prefer to determine free Ix-values and materials (aluminium, steel, etc.). In the right part of the form you can find under “Calculation” the applied wind load and the required Ix-value. 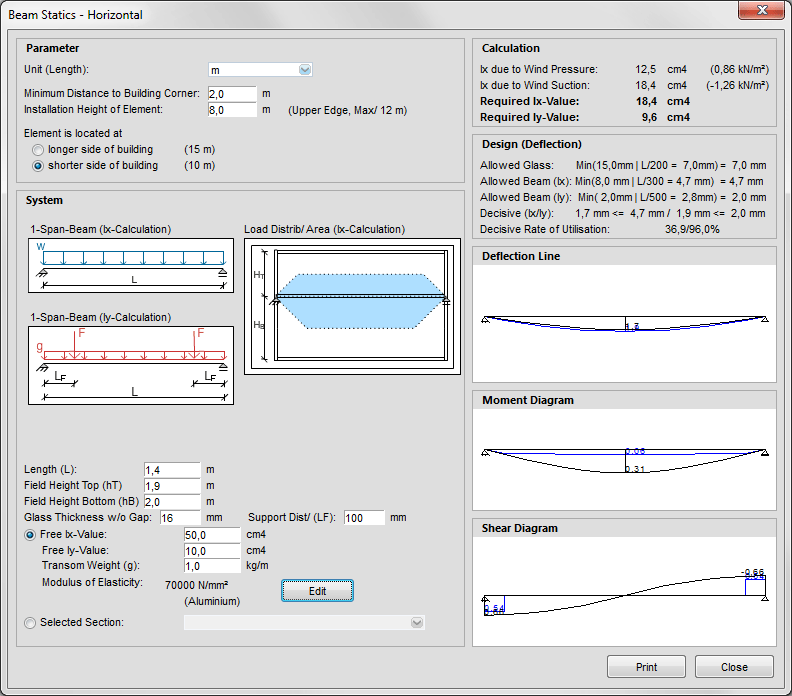 The field “Structural Analysis” shows the applied deflection limits and the current deflection including the section’s rate of utilisation. In order to simplify the design of single-span-beams it is assumed that the length of the glass edge equals the length of the beam span. The applied load area is calculated separately for the left and right field as trapezoid or triangle. If you want to consider glass fields more accurately select the option “Multi-Span-Beam”. 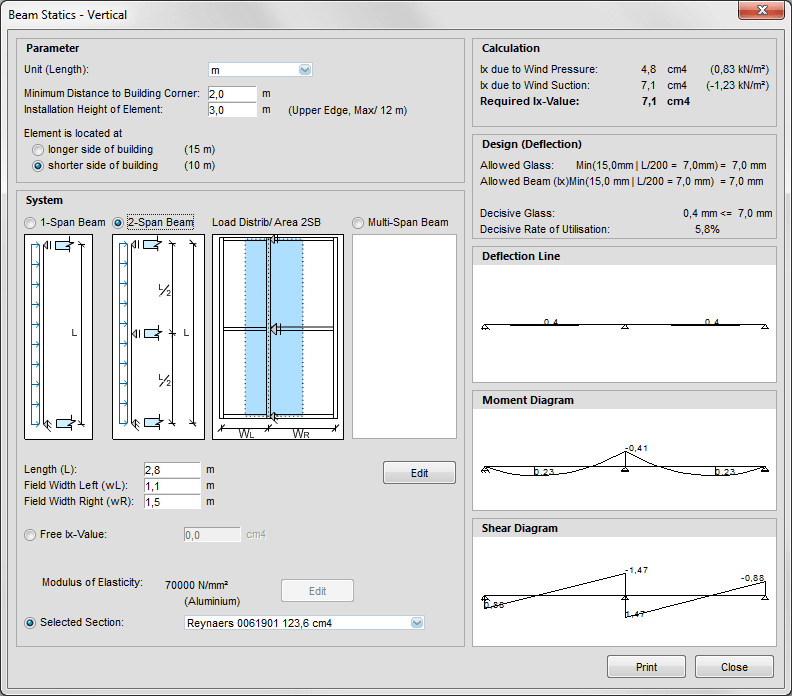 The entries for the preliminary structural design of double-span-beams follow the same input principles like single-span-beams. However, it is assumed in order to simplify that the applied load area is represented by a rectangle resulting from half of the left and right field width each and that the length of the glass edge equals half of the length of the beam. 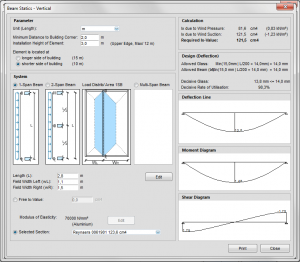 The most precise method to design mullions consists in entering those as multi-span-beams. Hereby it is possible to consider different glass field heights and widths on the left and right side of the mullion. 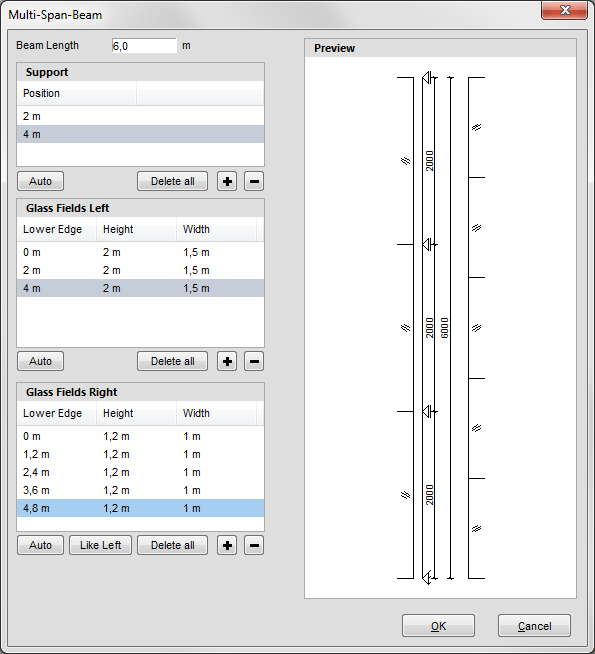 For this select the option “Multi-Span-Beam” under “System” first and click the button “Edit” afterwards. 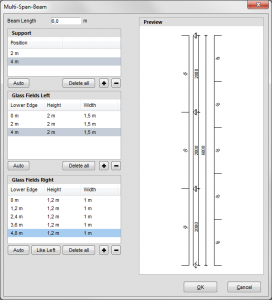 In the form “Multi-Span-Beam” you are able to determine beam length, supports and glass fields. Under “Support” it is possible to define additional intermediate supports either by the button “Auto” which splits the beam in equal spans or to set intermediate supports manually by the button “+”. The glass fields left and right follow the same principle. For a preliminary structural design of transoms click the button “Beam Statics – Horizontal” on the main menu of the structural analysis module. The input works the same way as the option “Single-Span-Beam” in the function “Beam Statics – Vertical”. 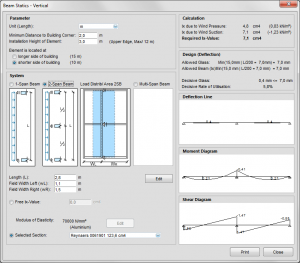 Here you must determine field height top and bottom instead of field width left and right. Furthermore the program requires information about glass thickness and glass support distance. On the right hand side of the form you can find the results of the Ix and Iy design where lines of the Ix calculation are displayed black and lines of the Iy calculation are displayed blue. 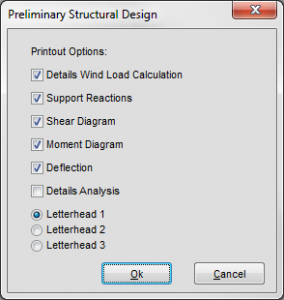 Printouts are created like in the function “Beam Statics – Vertical”.